From the moment a professional hockey player begins his career, time is scheming to strip away his speed, strength and skill. The aging process is inevitable, inescapable. Take care of your body, eat right, get plenty of rest -- it doesn't matter. Ligaments lose their elasticity, muscles weaken and the body breaks down for even the most diligent and gifted of athletes who once were considered indestructible. Yet for a select few, the laws of aging seemingly don't apply them. While others see their talents diminish, these special human beings seem immune to the deterioration of their youth. Teemu Selanne, Nicklas Lidstrom, Dwayne Roloson and Mark Recchi are the exception to the rule, proving 40 doesn't necessarily mean the end of their careers -- far from it. Selanne, 40, is ninth in the NHL with 76 points in 68 games for the Ducks; Lidstrom, also 40, is second among defensemen with 61 points and the Red Wings legend should be among the finalists for the Norris Trophy; Roloson, 41, has four shutouts since he was acquired by the Lightning in January to solidify their goaltending; and Recchi, 43, has 13 goals and 47 points in 77 games for the Bruins. No one will argue that these players no longer are in their primes, but they aren't run-down, washed-up former stars barely hanging on to their glory. All are important pieces to teams looking to make deep runs in the 2011 Stanley Cup Playoffs. Detroit's Mike Modano, 40, could have been part of this group if he hadn't missed most of the season with a wrist laceration suffered in November. He still has 15 points in 36 games. Selanne has been hemming and hawing on retirement since 2007, when the Ducks won the Stanley Cup. He entered this season saying it would be his last, but he understands if people choose not to take him at his word. "I don't know," Selanne said. "My wife doesn't even believe anymore." Why would she? Selanne repeatedly has said that he wants to keep playing as long as he's having fun, which clearly is the case this season. He's scoring goals, his team his winning, and most importantly, he's healthy heading down the stretch. Selanne has 7 goals and 5 assists in his last six games, including a game-tying goal with seven seconds remaining in regulation against the Dallas Stars that led to Cam Fowler scoring the winner for the Ducks in overtime. Coach Randy Carlyle said earlier this season the key to Selanne's success is getting him to his "happy place," which is just a fancy way of saying Selanne is at his happiest when he's scoring goals. With 28, it's safe to say Selanne, who has been taking better care of himself in the twilight of his career, is in his happy place. But it doesn't necessarily mean he's ready to declare himself prepared to return for another season. "My mind goes like an elevator," Selanne said after a 3-goal, 2-assist showing against the Avs on Monday. "One day I feel I could play 10 more years and the next day I feel like, 'Why are you still doing this?' That's why I'm not even thinking about that during the season. It's better to think about those things after the season, when you're stable. "But, you know, I'm really enjoying this game, and obviously that's why it's so much fun." The same can be said for Lidstrom, who is having his best season offensively since 2007-08 and could reach the 18-goal mark, which would match his best output in that category since 2002-03. He leads the Wings in average ice time per game (23:32), power-play assists (32) and has shown durability at 40 by tying for the team lead in games played with 77. As good as Selanne has been this season, he's nowhere near the production of his best seasons. Lidstrom, however, isn't that far removed from what he was doing in his prime. "He's one of those guys that's a freak of nature, the shape he's in," Niklas Kronwall told Mlive.com. "We're so spoiled having a guy like that around." Former teammate and current Lightning GM Steve Yzerman has shown his belief in Roloson, who he acquired Jan. 1 to fix the biggest weakness of a team that has the potential to reach the Stanley Cup Final. Roloson is enjoying his best season since he was a spry 36-year-old with the Edmonton Oilers in 2005-06. He backstopped the eighth-seeded Oilers all the way to the Cup Final before suffering an injury in Game 1 against the Carolina Hurricanes that caused him to miss the remainder of the series. It's practically postgame tradition in NHL locker rooms for players to engorge themselves on pizza to regain lost calories. While that may be for suitable for younger players, there were times when Roloson could be seen enjoying a salad after a game while playing with the Islanders earlier this season. With the Lightning, Roloson has continued an extensive training regimen that not only keeps his body fit, but also his eyes. It's just part of the territory when you cross into your 40s and must maintain an edge. 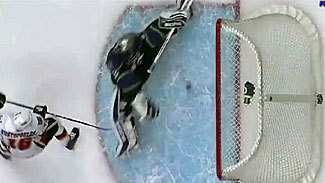 "The end point is, you train your eyes like you train your body," Roloson told the St. Petersburg Times. "When your eyes are tired, they're telling your body it's tired. So if you train your eyes, the overall effect is you're less tired because your eyes aren't working as hard because they're conditioned properly." Retirement isn't even a consideration for Roloson right now: "I want to keep going until my play drops to where I can't play, or I can't through injuries." Recchi likely will finish this season with about 49 points, a far cry from the four straight 90-ponit seasons he had for the Penguins and Flyers from 1990-94. It also doesn't put him in the same echelon with Selanne, Lidstrom and Roloson, but it's not fair to hold Recchi to that standard. At 43, Recchi has far more mileage on his body than his over-40 counterparts. That's why he has rededicated himself to fitness to prolong his career and maintain his durability. Not only is Recchi on pace for his best point total since 2006-07 (although he played fewer games then), but he'll likely play at least 80 games for the fourth time in five seasons. Recchi laid the foundation for his current success earlier in his career, when he got some advice from the veterans around him. It's allowed him to become the 12th all-time leading scorer in the NHL with 1,532 career points. "I really paid attention to that. I got into nutrition and learning how to eat properly and obviously my training just kept getting better as it went on." Recchi, Selanne, Lidstrom and Roloson all are in the final year of their contracts. There's no doubt there will be a market for the veterans during the summer -- the question is will they all want to come back. 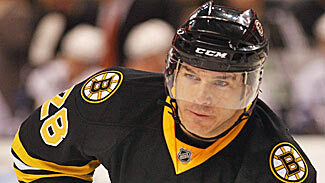 Lidstrom and Roloson haven't hinted at retirement, but Recchi has said he's done if the Bruins win the Stanley Cup. Selanne -- as always -- is non-committal about his future. "After the season it's time to think about it," Selanne said. "In a lot of ways, when I think it's going to be my last year, like I've done the last four years, I try to think this is going to be it and I try to enjoy every day. I'm not going to leave anything here. That has been really good for me."